If your day-to-day life is feeling like a treadmill where everything is urgent but nothing gets done, bestselling authors Gary Keller and Jay Papasan have a solution for you. It is called “the one thing”: the idea that you need to pause, evaluate your end goal, and then focus only on the “one thing” that will move you toward that goal, working on it until the task is complete — whether it takes minutes or months. In the wake of advice books that focus on multitasking as a productivity solution, this viewpoint is a breath of fresh air. 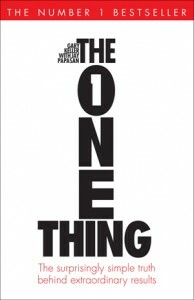 More importantly, according to the authors, this “one thing” method is how extraordinary results are best achieved, both in today’s society and throughout history. But though the solution is simple in theory, it can be difficult to put into practice. That’s where the authors’ guidance is crucial. The book promises that by focusing on one thing, relentlessly, we can turn a goal into an accomplishment. With advice on how to define, choose, modify and measure the results of pursuing the one thing, we can move closer and closer to achieving our most important goal. While the book is informative, it’s not just a step-by-step manual on productivity. Broken into short chapters that start with motivational quotes, the authors mix of case studies and their own experiences running successful ventures offer entertainment as well as guidance. This is more than just study of productivity concepts, it’s a practical how-to guide for blocking out mundane distractions and managing time in everyday life. Do you want to accomplish that big goal you have been trying to complete for years? This is your read.